Home > MF - AMFI > AMFI 2nd Mutual Fund Summit 2018 emphasizesrising digital confluence & encouraging fixed income investments..! AMFI 2nd Mutual Fund Summit 2018 emphasizesrising digital confluence & encouraging fixed income investments..! Association of Mutual Funds in India (AMFI), the trade association of Asset Management Companies (AMCs) of all Mutual Funds in the country, at its second edition of the annual Mutual Fund Summittoday discussed how the next phase of growth in Mutual Funds would come from -Greater adoption of digital technology ‘#thinkdigital’ in intermediation and customer service; and by developing fixed income segment as the retail investment avenue for the large pool of small investors across the country. These two initiatives would form the corner stone of AMFI’s key focus areas and would drive the growth for the Indian Mutual Fund Industry across the country over the period of next 12 months. The annual AMFI Mutual Fund Summit is aimed at channelling discussions about the industry’s strengths and opportunities, celebrating achievements over the past year and addressing challenges, for taking the mutual fund industry to newer heights. The theme of the second edition of the event is to define the roadmap for expansion of the mutual fund industryand enhance the ease of doing business by leveraging on digital technology. The event, also celebrated 25 years of private sector mutual funds in the country. He added, “I feel the time is now ripe for the industry to concentrate on B-30 centres and perhaps B-50 centres. There is a need for accelerated and faster growth in geographical reach of MFs and bring in long term money from smaller towns. This is also necessary given that there is overall policy focus to channelize more of household savings towards financial assets. I hope that the dispensation to allow AMCs to charge additional TER of 30 bps of new inflows from beyond top 30 cities would facilitate in further deepening the industry”. 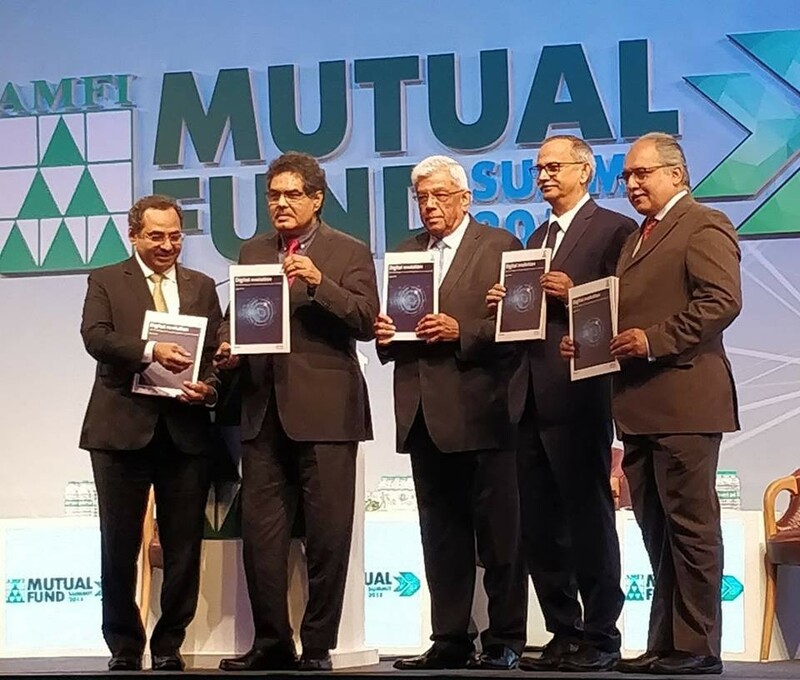 Shri Ajay Tyagi, Chairman, Sebi along with Shri A Balasubramanian, Chairman, AMFI, Shri N S Venkatesh, CEO, AMFI, Shri Deepak Parekh, Chairman, HDFC Ltd and at the AMFI Second Mutual Fund Summit organised in Mumbai. AMFI in association with Crisil launched AMFI CRISIL Fact Book for 2018, which was unveiled on the occasion. ‘’On the digital front, I would also like to share that, AMFI is collaborating with all the AMC’s to re-energise the industry platform – MF Utility (MFU). In fact, all the AMC CEOs have in principle agreed to re-capitalize the MFU and help in its development to emerge as an industry-leading digital platform,’’ Mr Balasubramanian said. Shri Deepak Parekh, Chairman of HDFC Ltd., the Guest of Honour at the event while sharing his vision for the Indian mutual fund industry emphasised on important trends including doubling of AAUMs to INR 50 Lakh crore in the next five years, inculcating ethical and investor-focussed approach towards distribution, digital disruption and protection of customer data, orienting investor approach towards long term investing, and also nurturing talent for heralding bright future for the Indian Mutual Fund industry. Smt Usha Thorat, Former Deputy Governor, RBI spoke on strengthening the debt market, while Shri Vijay Shekhar Sharma, Founder & CEO of Paytm, spoke at the summit on,“Leveraging Technology for the next phase of growth”. According to the latest edition of the AMFI-CRISIL Fact Book, the ratio of the mutual fund industry’s assets under management (AUM) to bank deposits has grown to a healthy 22% as of March 2018, up from mere 13% as of March 2016. During the period of March 2017 to June 2018, the average AUM grew to INR 23.4 lakh crore from INR 18.3 lakh crore, a growth of 39%. The average number of folios too grew by 35% or an addition of more than 1.92 crore folios. The number of folios increased to 7.46 croreof which 2.28 crore portfolio are SIP portfolios, from earlier 5.54 crore folios. The report goes on to mention that the mutual fund industry has been an early adopter of technology and this has paid rich dividends and can be seen in the rapid influx of digital money into the industry; the share of gross flows through digital mode has grown from just about than 0.5% two years back to nearly 10% as of June 2018. The full day event saw eminent CEOs and top management personnel from various fund houses and representatives from distribution partners and associations discuss ways in which customer base could be broadened.